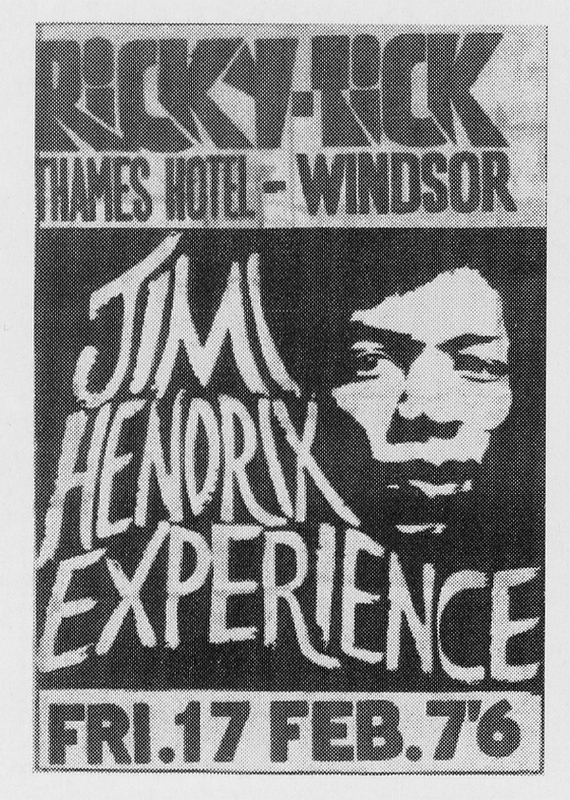 The Jimi Hendrix Experience perform at the Bromel Club in the Bromley Court Hotel located in Bromley, Kent, England. 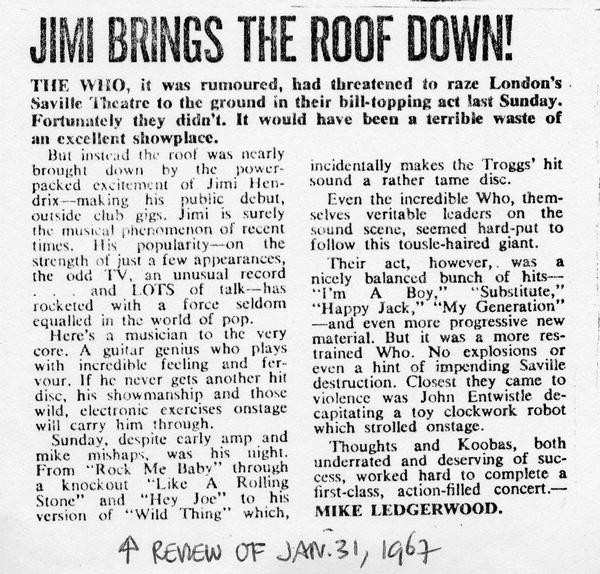 Jimi Hendrix is interviewed by Richard Green for the January 14th edition of Record Mirror. 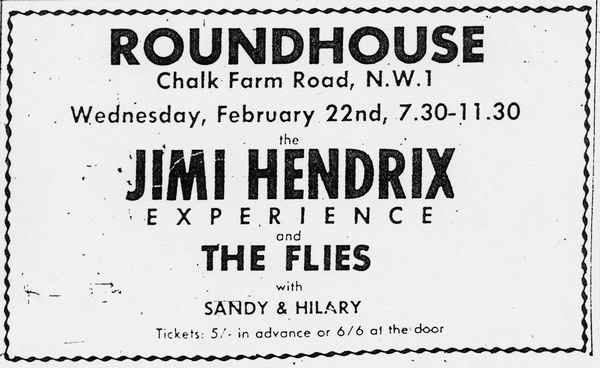 Jimi Hendrix is interviewed for a February article in Rave magazine. The Jimi Hendrix Experience participate in a photo session for Fabulous 208. 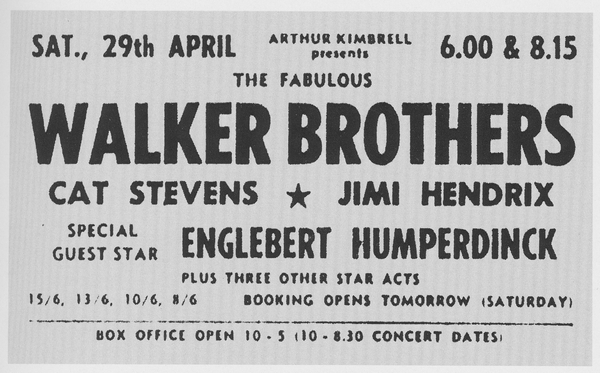 The Jimi Hendrix Experience perform at the New Century Hall located in Manchester. Opening support is by DJ Dave Eager & The Silverstone Set. 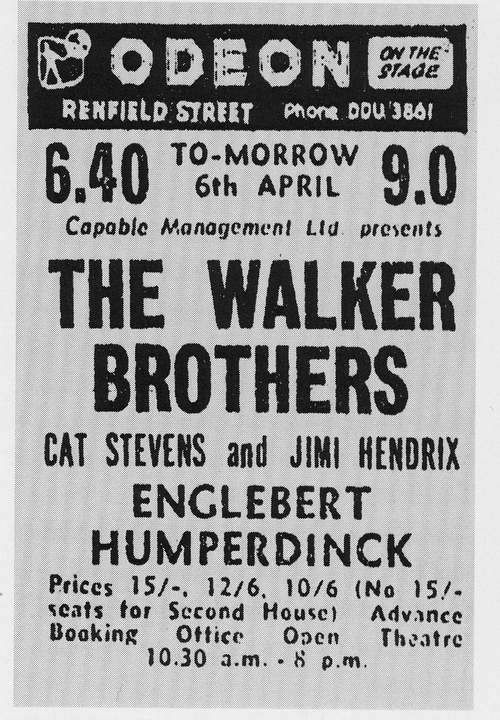 Following their performance at the New Century Hall, The Jimi Hendrix Experience visit the Twisted Wheel Club on Brazennose Street in Manchester. The Experience perform at the Mojo A Go-Go’s Tollbar. Jimi Hendrix is interviewed at his flat on 34 Montagu Street in London by Keith Altham. The interview is published in New Musical Express on February 14. Following his interview with Keith Altham, The Experience participate in a photo session. 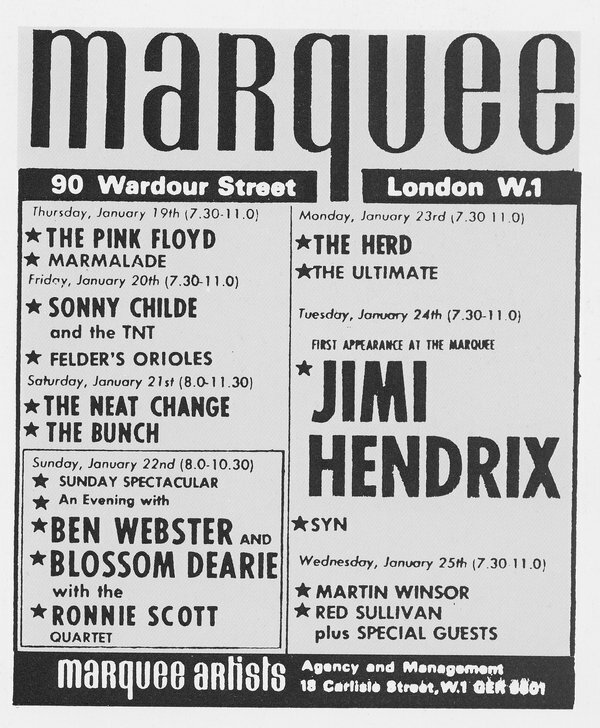 Jimi Hendrix is interview by Nick Jones for the January 21st edition of Melody Maker. Jimi Hendrix writes the lyrics to “The Wind Cries Mary” following an argument with live-in girlfriend Kathy Etchingham. Looking to get something new to market following their debut “Hey Joe,” Chas Chandler brought The Experience to DeLane Lea Studios in London to commence work on their next songs. This session included the basic track for “Purple Haze,” which was recorded in merely four hours. 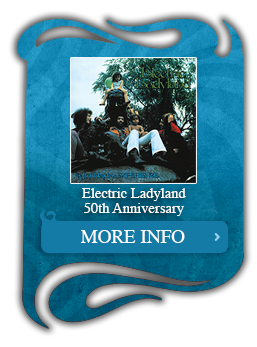 Additional recordings including “The Wind Cries Mary,” “51st Anniversary,” “The Wind Cries Mary” and “Burning Of The Midnight Lamp” were also completed. 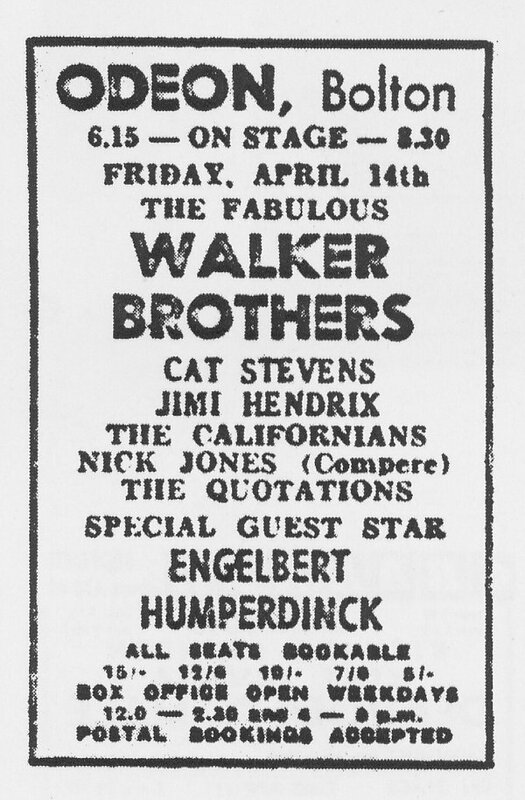 After a day full of recording at DeLane Lea Studios, The Jimi Hendrix Experience performed two shows at the venerable Bag O’Nails. 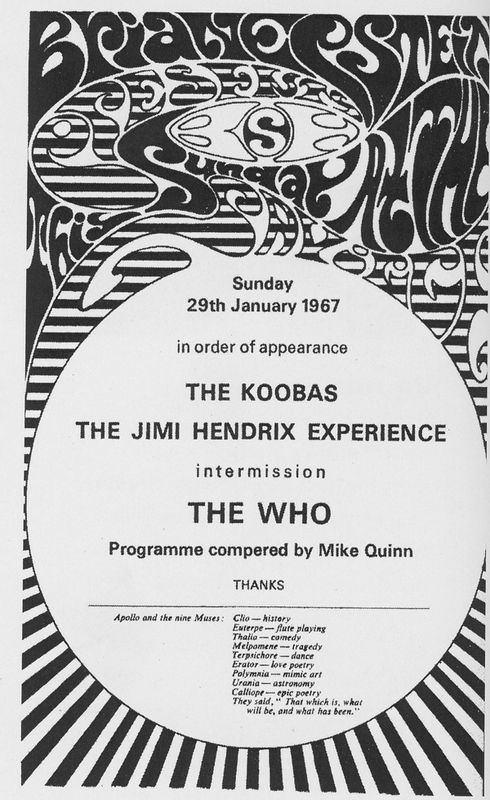 Hendrix continued to make waves in the local music scene, and whenever possible a large group of fellow musicians would attend The Experience’s shows. 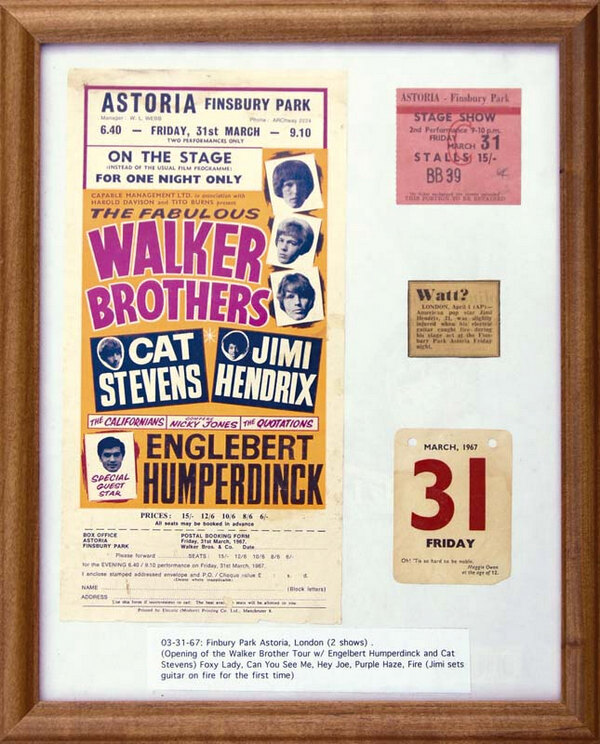 On this date it has been reported that The Beatles’ Paul McCartney and Ringo Starr were in attendance, as was The Who’s Pete Townshend and John Entwistle, The Rolling Stones’ Bill Wayman, The Cream’s Eric Clapton, Lulu, The Animal’s Eric Burdon, Georgie Fame, Geno Washington, Denny Lane, and Donovan. 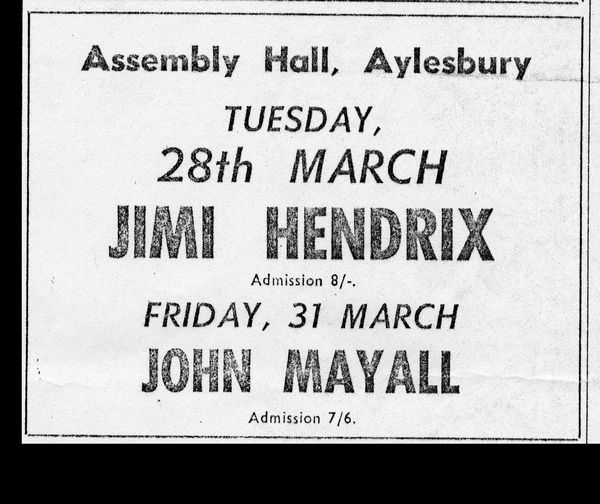 This evening also marks the first time that Jimi Hendrix meets guitar effects wizard Roger Mayer, who would later create several effects pedals for the guitarist. The Experience perform at the 7 1/2 Club, which marks the club’s opening night of performances. The Jimi Hendrix Experience perform at The Country Club. 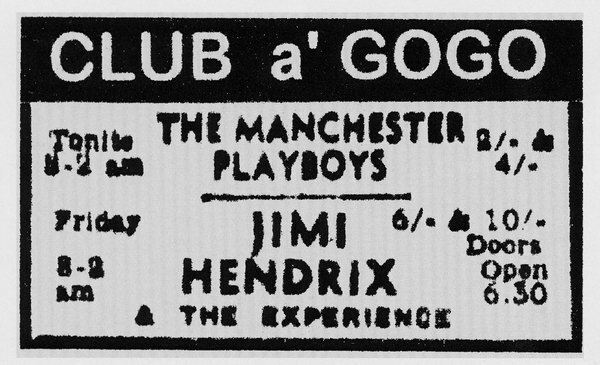 The Jimi Hendrix Experience perform at 7 1/2 Club. The Jimi Hendrix Experience reportedly prepare recordings for Radio Luxembourg’s Ready Steady Radio! program at Tiles in London. The session never airs. 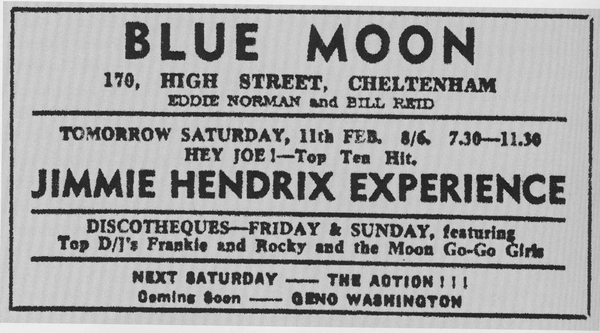 The Jimi Hendrix Experience perform at 7 1/2 Club ending their three-night engagement at the popular nightspot. 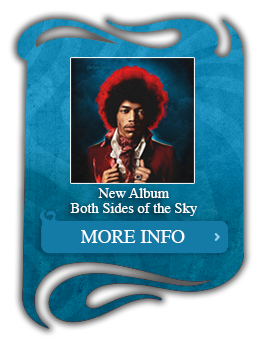 Jimi Hendrix is interviewed by Mike Legerwood for the January 28th edition of Disc & Music Echo. 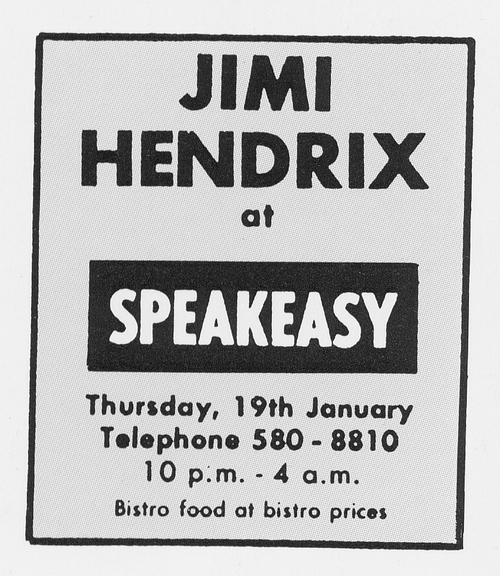 The Jimi Hendrix Experience perform at The Speakeasy. 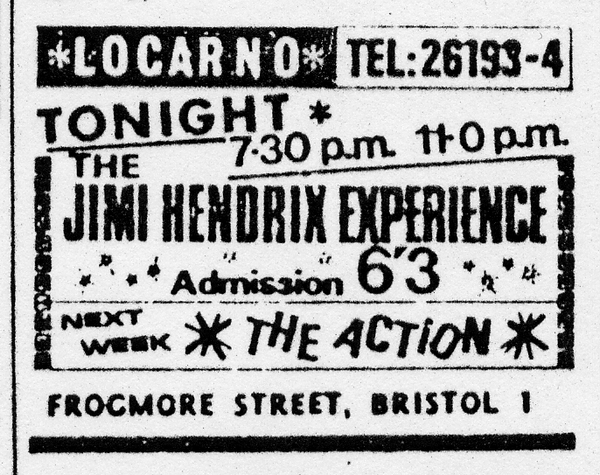 The Jimi Hendrix Experience performance at the Astoria in Oldham, Lancashire. 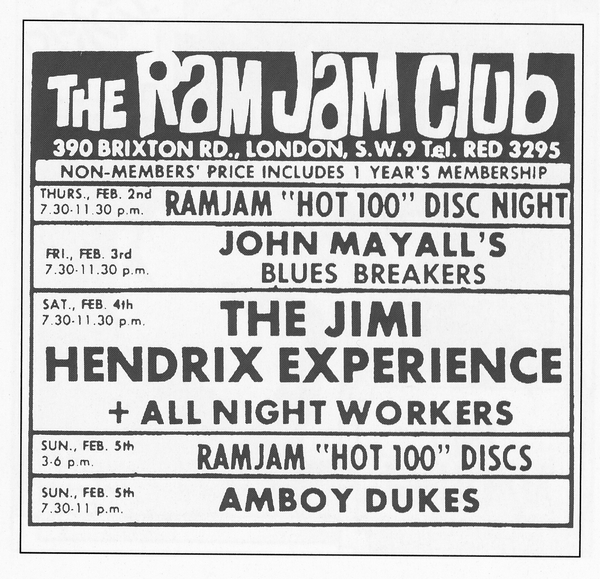 Jimi Hendrix is interviewed for the January 28th edition of Melody Maker. The Experience perform at The Refectory in Golders Green, Barnet, London. The Experience participate in a photo session at The George Public House. The Experience conduct a photo session with Paul Popper outside of Hendrix’s flat in Montagu Square. 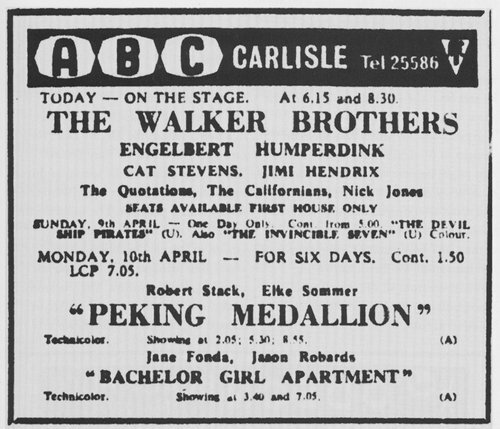 The Jimi Hendrix Experience make a live appearance on the radio program Pop North on the BBC Light program. Unfortunately, with the show being aired live, the BBC did not record or preserve the performances. The Experience return to the Saville Theatre with filmmaker Peter Clifton to film additional footage of The Experience performing “Hey Joe.” This color film footage is later interspersed with the black & white footage shot during The Experience’s live concerts from January 29th and included in Clifton’s films Superstars In Concert and Popcorn, plus mixed together with a studio recording of “Hey Joe” for the song’s promotional music video. Jimi Hendrix is interviewed by Alan Jones for the February 3rd edition of The Hull Times. The Experience perform at the New Cellar Club in South Shields with support from The Bond. 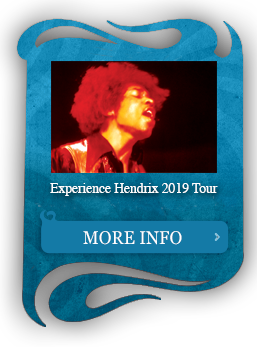 Following The Experience’s performance, Jimi Hendrix is interviewed by Charles Webster for a February 3rd story in The Northern Echo. Tape Log: Purple Haze	The studio sessions on February 3rd marked The Experience’s first foray into Olympic Studios and their first time working with engineer Eddie Kramer. This initial session saw Hendrix return to the January 11th masters for “Purple Haze” to record some additional overdubs. This initial “Purple Haze” session at Olympic foreshadowed just how creative and cutting edge the team of Hendrix, Chas Chandler and Eddie Kramer would become in the months that followed. This recording session also marked one one of the first times that Hendrix recorded in the studio with Roger Mayer’s experimental Octavia effects pedal. The Experience perform at Ricky Tick in Hounslow. 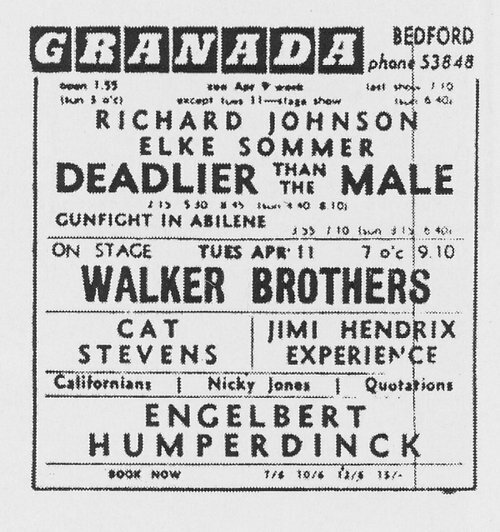 Jimi Hendrix attends The Cream concert at the Saville Theatre. 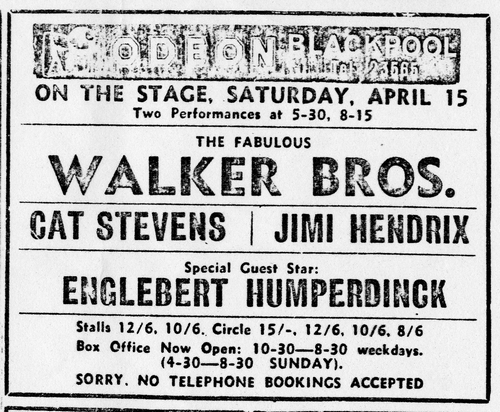 Jimi Hendrix is interviewed by Steve Barker for an article in Debris, the student newspaper for West One. The Jimi Hendrix Experience perform at the Star Hotel in Croydon, Surrey, England. Jimi Hendrix returns to Olympic Studios to complete further work on “Purple Haze” alongside Chas Chandler and Eddie Kramer. Noel Redding contributes some of the background vocals during this session. The Experience returned to Olympic Studios where the group completed a final mix on their new single “Purple Haze.” Afterwards, the trio revisited the four-track master for “Fire” which was previously worked on at DeLane Lea Studios. In the end, the original DeLane Lea track was basically replaced with new work. “Foxey Lady” received similar treatment, this time revisiting the December 13, 1966 tapes that were conceived at CBS Studios. By the end of the night, a final mix was in hand. The Experience perform at the Bromley Court Hotel’s Bromel Club. The Experience perform at the Plaza Ballroom. Photographer Bernard Wagner completes a photo session with Jimi Hendrix outside of his apartment at 34 Montagu Square on Marylebone. The Jimi Hendrix Experience perform at the Sinking Ship Clubland in Stockport. Jimi Hendrix is interviewed by Alain Dister at the Anim management office on Gerrard Street. The Experience perform at The Civic Hall in Grays, Essex. Alain Dister who interviewed Hendrix back at the Anim management office earlier in the day accompanied The Experience, as did Alan Price (previously of The Animals). 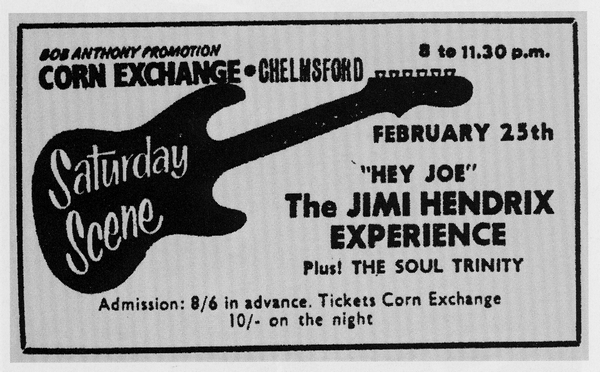 Following their gig at The Civic Hall in Essex, The Experience attend the “Valentine’s Day Massacre” at The Speakeasy. While at The Speakeasy, Jimi Hendrix jams with Skip Allen, drummer for The Pretty Things. Jimi Hendrix is interviewed by Kevin Swift for the March issue of Beat Instrumental and the February 25th edition of Record Mirror Jimi is also interviewed by Albert Bokslag and Cees Mentink for the February 25th edition of Kink. The Jimi Hendrix Experience perform at The Dorothy Ballroom in Cambridge. 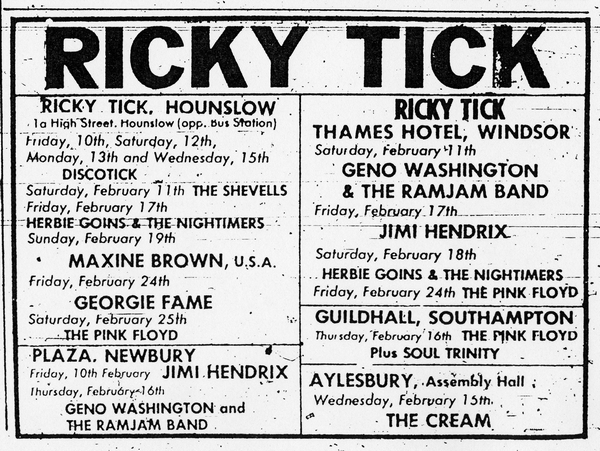 The Experience perform at the Thames Hotel’s Ricky Tick nightspot in Windsor. The Experience perform at York University. The Experience perform at the Blarney Club on Tottenham Court Road in London. UFO Club was founded by John Hopkins and Joe Coyd in an Irish dance hall called the “Blarney Club” in the basement of 31 Totenham Court Road. 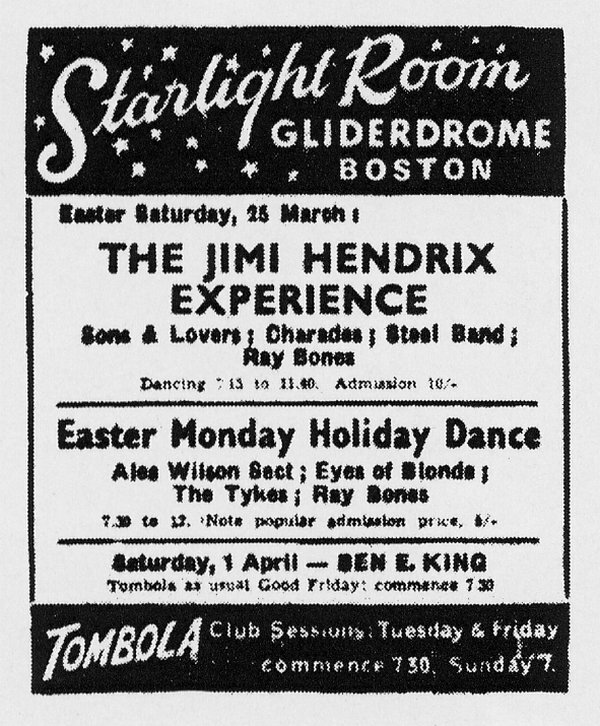 After its opening in December 23, 1966, the club gained considerable recognition as ‘ground zero’ for the underground movement and the first psychedelic nightclub in England. 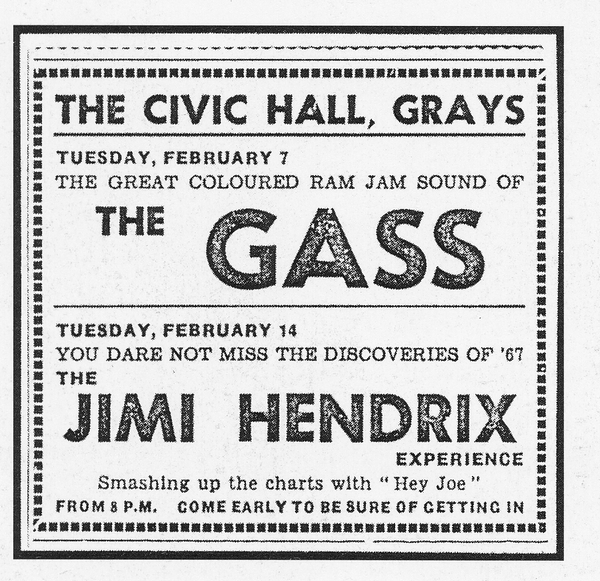 It regularly played host to bands like Pink Floyd. The Experience perform at The Pavillion in Bath. The Experience head back to De Lane Lea Studios to continue work on their debut album. Recordings this evening focused on “I Don’t Live Today,” and by the session’s end, Chas Chandler had a working master in hand. The Experience are interviewed at the Anim management offices for a March 11th issue of New Musical Express. 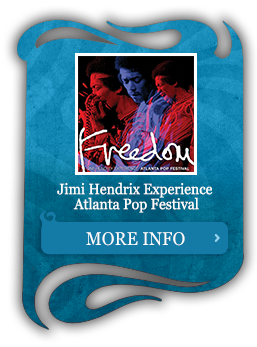 The Experience are invited to the BBC Studios to perform “Hey Joe” live on the program Parade Of The Pops. 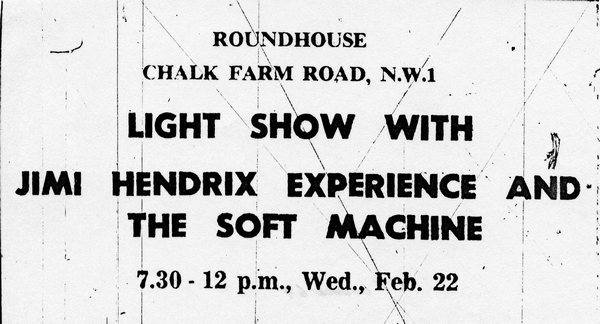 The Experience attend a press reception for Soft Machine. The reception was hosted by Chas Chandler who produced the band’s first single “Live Makes Sweet Music,” which was just recently released. The Jimi Hendrix Experience are photographed at Bruce Fleming’s studio in London. 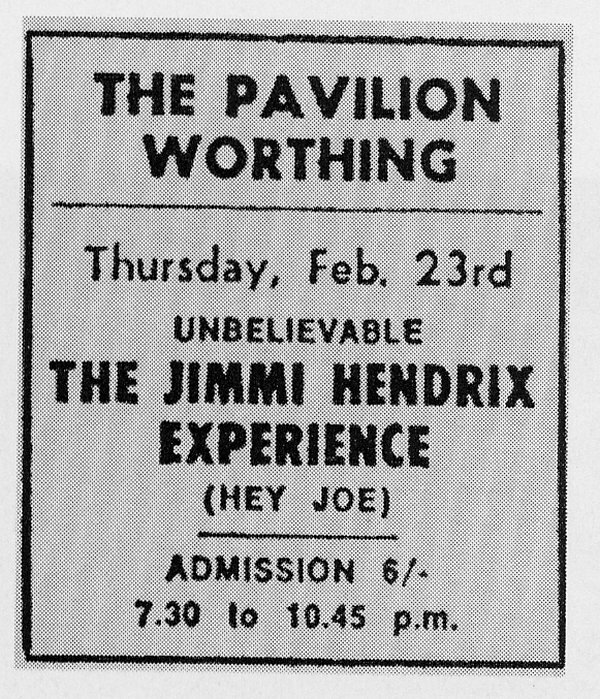 The Experience perform at The Pavillion in Worthing, Sussex. The Experience perform at Leicester University. 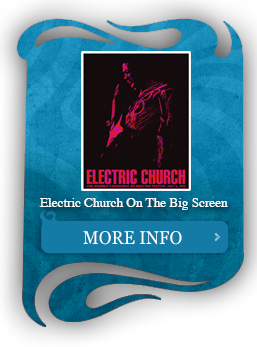 The Jimi Hendrix Experience perform at Corn Exchange with support from The Soul Trinity as part of the venue’s “Saturday Scene” event. Portions of the show including “Stone Free” and “Like A Rolling Stone” were captured on film by a Dutch filmmaker, Roeland Kerbosch. The footage marks the earliest known film footage of The Experience in concert. 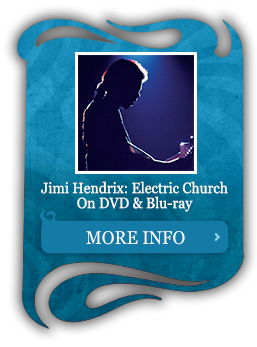 These recordings were issued as bonus footage on the 2007 DVD release The Jimi Hendrix Experience: Live At Monterey. A second photo session with Bruce Fleming at his London studio is completed on this day. Where the first session focused primarily on black & white photos, this session focused on color photography. The results of which appeared on the cover for the UK pressing of The Experence’s debut album Are You Experienced. Following The Experience’s performance, photographer Vaughan Willcox completes a photo shoot with Hendrix backstage at Gaumont. Jimi Hendrix participates in a photo shoot at the Fleet Street offices of the Daily Mirror in London. The Experience returned to London’s Olympic Studios to continue work on their debut album. This significant session resulted in new recordings, overdubs on some unfinished compositions and final mixes for several tracks. Hendrix then focused his attention on “Title #3” and later “Title #4” which eventually became “Are You Experienced?” Despite the the complexities of these recordings, the full song “Are You Experienced?” was completed start-to-finish in this one session. Later the group revisited the January 11, 1967 recordings of “Third Stone From The Sun” before redirecting attention to creating both mono and stereo mixes of “Highway Chile.” The mono mix was eventually held back and included alongside a stereo mix of “The Wind Cries Mary” as the trio’s third single in the United Kingdom. Before the session was completed, Hendrix focused once again on the work completed in December 1966 on the song, “Love Or Confusion” which resulted in a final mix being produced and later included on the debut release of Are You Experienced. Chas Chandler had lacquers created for both mono and stereo mixes of “The Wind Cries Mary” and a mono version of “Highway Chile” which were given to Track Records so manufacturing of The Experience’s forthcoming single could begin. 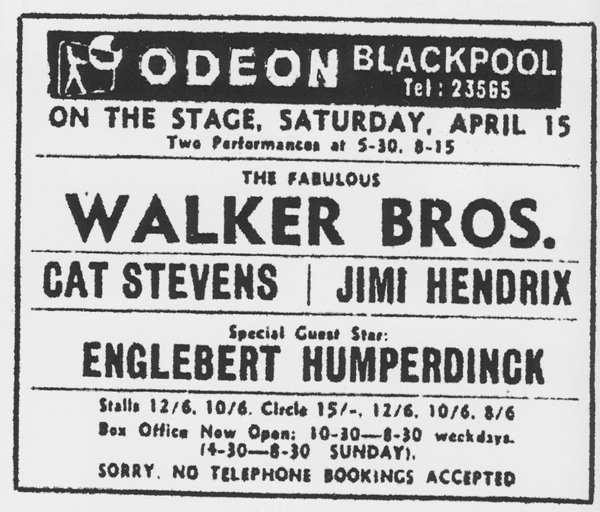 Following their performance at the Odeon Cinema, Jimi Hendrix is interviewed backstage by Donald Bruce for an April 7th article published in The Dundee Recorder. In the afternoon, Jimi Hendrix and Mitch Mitchell are photographed by Mike Huggon at the Fringe Boutique in Carlisle. 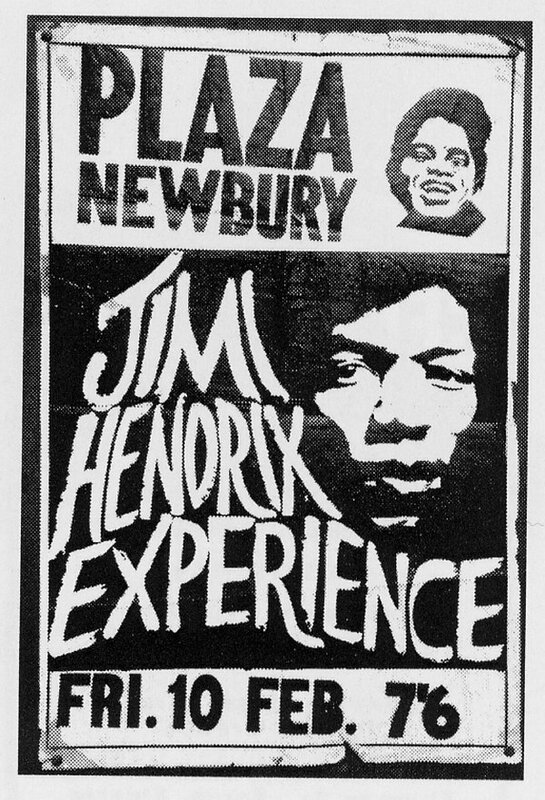 The Jimi Hendrix Experience perform at the BBC Playhouse Theatre on Northumberland Avenue in the City of Westminster, London. This made-for-live-radio performance was broadcast on the Monday Monday radio program. 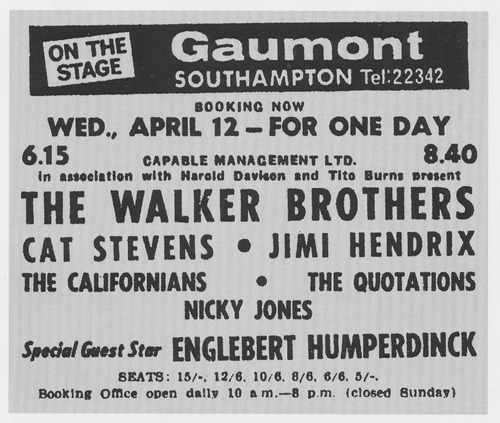 Unfortunately no recordings are known to exist for this performance. The session featured two non-musical tracks called described on the tape boxes as “Wild Chat” and “Noises” which featured Hendrix and Chandler talking through a variety of science fiction inspired passages. 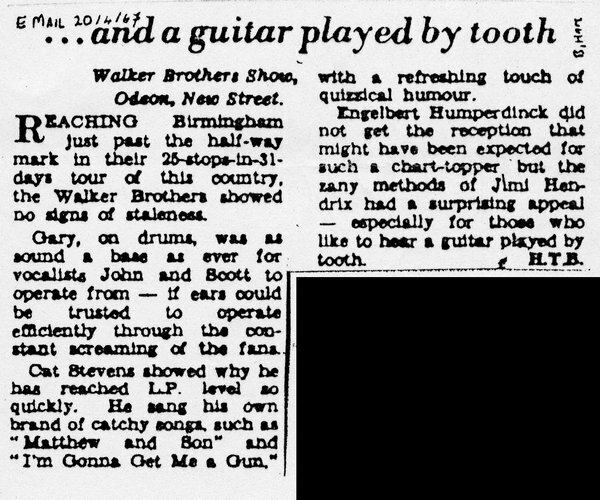 “Noises” featured Hendrix talking about the markings that Engineer George Chkiantz had made on the tape boxes that evening. The Jimi Hendrix Experience participate in a photo shoot at the Anim management office in London. 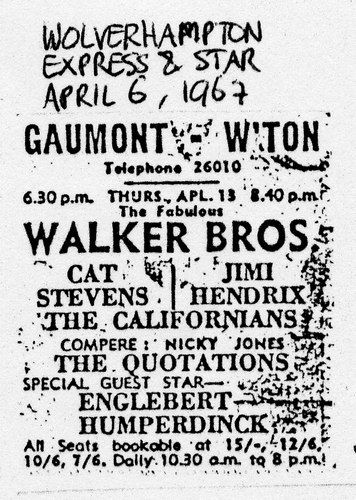 Following their evening performance at Gaumont Cinema, Jimi Hendrix jams with The Californians at The Kingfisher Club in Wall Heath. 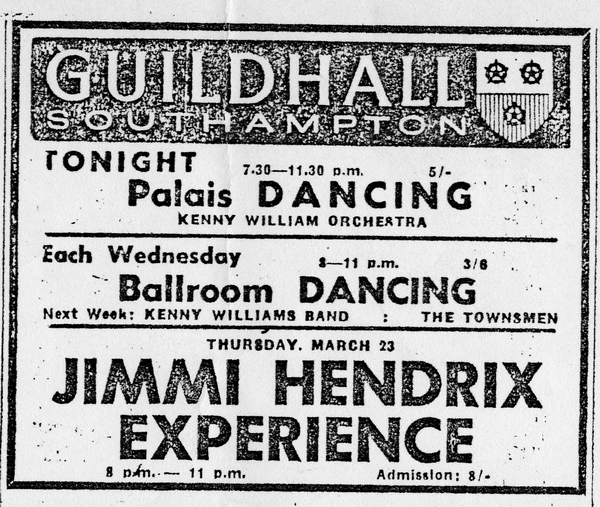 Jimi Hendrix (playing bass guitar) reportedly jams with Ben E. King and Georgie Fame at The Speakeasy in London. 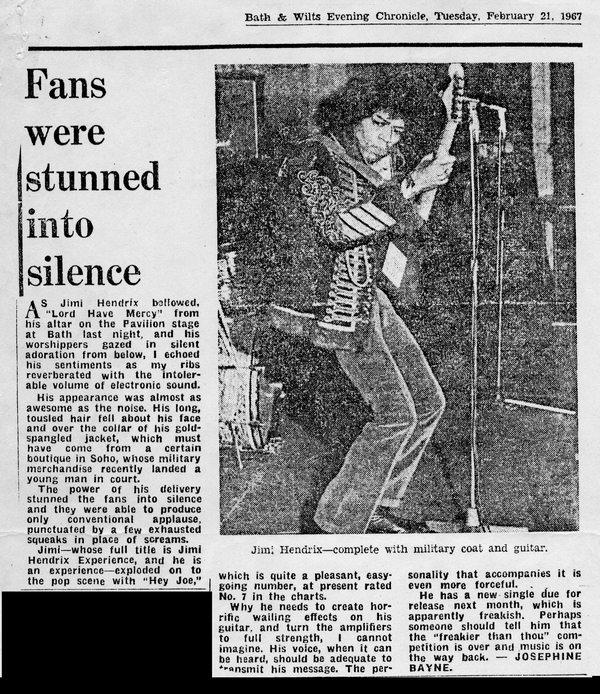 Following their performance at the ABC Cinema, Jimi Hendrix is interviewed for a feature in the April 21st edition of The Lincolnshire Echo. 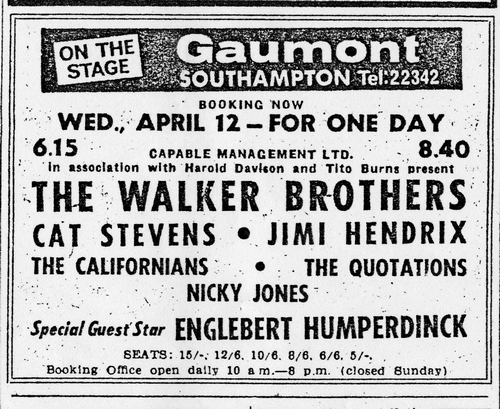 The Jimi Hendrix Experience is interviewed by Steve Mann for a May 5 feature article in The Aldershot News. Album Release The new album The Street Giveth… And The Street Taketh Away by Cat Mother & The All Night Newsboys is released in the United Kingdom. 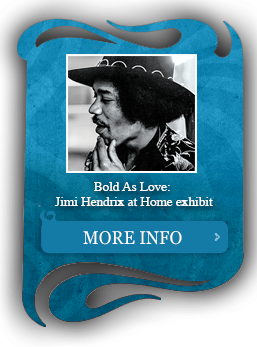 The album produced by Jimi Hendrix and spawns the hit US single “Good Old Rock n’ Roll”. Wally Heider Recording, Los Angeles, Ca. Studio 3, Mixing Eddie Kramer resumed mixing recent live recordings of the Experience for a possible live album.